The holidays are here, and that means people are traveling to different countries. Some people are taking advantage of the low cruise prices and opting to stay overnight off the ship. This is their first cruise and you know them well enough to know they haven't even thought about needing a foreign plug adapter for that night off the ship. College students are going on winter vacations, or school mission-type trips to other countries. Are you sure your college student will think to get a plug adapter or just fry their hairdryers, curling irons, and electric shavers. When you think of these scenarios, you might be thinking of Americans traveling and needing an adapter for Europe, Asia, Australia, or other countries. But what about your friends and family traveling here? Or that college student traveling here to see you? Do they have that plug adapter for the United States? 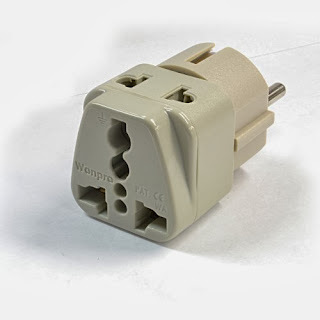 The need for plug adapters is traveling to all countries, including the United States. For anything that you would plug in, you need that plug adapter. It would be sad to plug your iPhone in without the adapter and ruin it. There are various types of plug adapters to choose from. There is the universal type, or the types suited for certain countries. So, if you are traveling or know of anyone traveling for the holidays, give them the gift of using their electronics - give a plug adapter. Wondering what kind is best? Just contact us and let's have that conversation.